Two hundred workers at the Sheraton Brussels hotel in Belgium are paying the price of a conflict between the owner, the UK-based property group International Real Estate Ltd, and Starwood, recently bought by Marriott. The hotel owner and Starwood, who managed the establishment, couldn't agree on who should pay for renovation and asbestos removal. The hotel was built in the early 70's and its renovation would cost some 50 million Euros. When Starwood and the owner failed to renegotiate the management contract, the hotel management simply walked away. 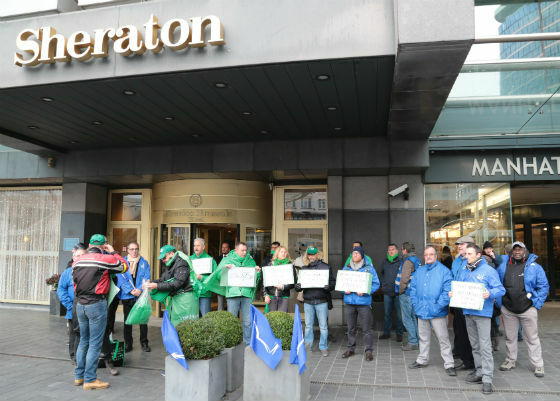 After some days of operating under self-management, on December 12 the Sheraton Brussels was declared officially bankrupt and 200 workers found themselves jobless. If the post-bankruptcy renovation takes longer than the 6 months' employment protection provided by law, the hotel will not have to re-hire current staff and new staff will be employed with lower conditions. Two-hundred workers are currently unemployed while a wealthy real estate company has filed for bankruptcy in order to reopen the same hotel after renovations. The IUF is supporting its Belgian affiliates FGTB-Horval, ACV-CSC and ACLVB-CGSLB in pressuring the Brussels Sheraton owner and creating space for the unions to negotiate an agreement which would secure re-employment for the workers when the hotel re-opens and maintain their conditions of employment under the previous CBA.